The best cacao varieties require shade to grow. That makes the Amazon rainforest the perfect scenario for high-quality cacao production, where the plants are shadowed by native trees such as chonta and mahogany. Aware of this advantage, the Kichwa indigenous from the Zancudo Cocha community in the Ecuadorian amazon have engaged in responsible cacao production aiming to adopt sustainable livelihoods. 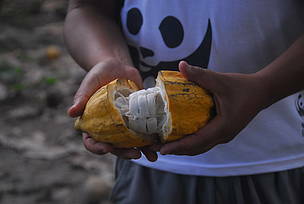 WWF-Ecuador, within the frame of the Northern Amazon Program’s strategy, has provided technical assistance to the community to ensure responsible cacao production and empower the community through sustainable livelihoods. Furthermore, WWF-Ecuador supported the community in the establishment of a commercial alliance with Pacari: a renowned Ecuadorian chocolate company that has received several international awards for the quality and flavor of its chocolate. Through a stable commercial relationship that guarantees the people from Zancudo Cocha are receiving the best price for their cacao, Pacari offers its customers the highest social and environmental standards while contributing to the conservation of the Ecuadorian rainforest. WWF-Ecuador is looking to further expand the work with Pacari by developing an alliance that aims to raise funds through sales of Pacari chocolate products made with the cacao from Zancudo Cocha. A percentage of sales would go straight to WWF-Ecuador’s conservation efforts. This represents a first step to establish innovative partnerships with companies and together finding solutions to conservation challenges.